Is Google AdWords the Right Venue for Promoting Your EVP? Google AdWords is one of the most intriguing advertising platforms on the web, offering businesses the chance to appear as sponsored results in Google search results. While it has long been a bastion of traditional marketing and advertising, recruiters are starting to see the potential that such a platform could have for strengthening their employer brands and attracting new job candidates. After all, if your ideal candidate personas are using Google to search for new knowledge and information (and, let’s be real, they almost certainly are), then what better place could there be for them to encounter your employer brand? That being said, Google AdWords does come with its share of hurdles. Because it’s so popular as an alternative (or a complement) to traditional SEO optimization, some keywords have become prohibitively expensive for smaller advertisers. This has prompted a lot of discussion about whether or not the platform is really worth using, but by and large these discussions focus on commerce, rather than recruiting. So, the question becomes, how do you know if Google AdWords is the right venue for spreading your employer brand and promoting your EVP? What Are Your Recruitment Goals? In order to determine whether or not Google is going to help you meet your recruitment goals, you first have to outline exactly what those goals are. Are you trying to hire for a particular position? Are you working on attracting new people into your recruitment funnel with employer branded content? Do you have stringent requirements for what types of candidates will meet your needs (like language needs or particular software experience)? AdWords can, of course, support all of these goals, but it will support some more easily than others. If, for instance, your initial goal involves some quick hiring for particular positions, AdWords’ ability to quickly drive website traffic effectively might outweigh the expense—assuming that your expected ROI for a new higher can justify temporarily high recruitment costs. For top of the funnel interactions, on the other hand, you might have to be more price-conscious, since the expected ROI for any particular candidate entering your recruitment pipeline will be much lower than in a full-scale hiring push. In cases like this, your AdWords strategy needs to be tailored to your overall game plan: maybe you aim for niche keywords related to your EVP (perhaps relating to particular tools you make available or educational opportunities) where your bids will go a little further. Crucially, you only pay by the click, so you could find yourself in a position where you’re familiarizing passive job candidates with your brand for free (though too much of this will effect your Google Quality Score). How Do You Want Applicants to Find You? 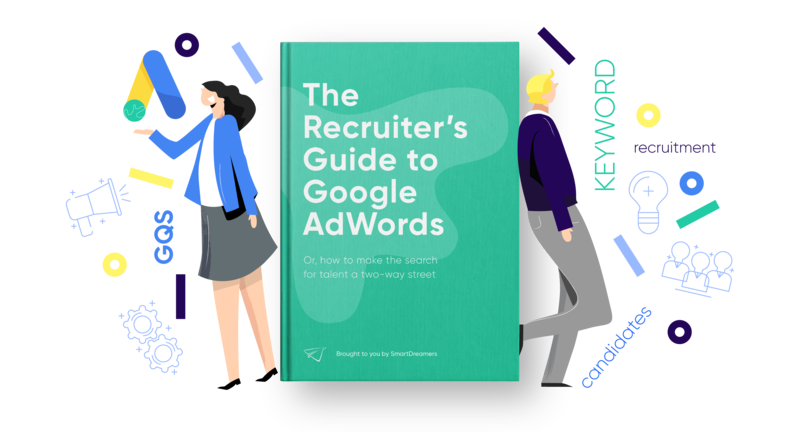 We saw above some of the ways in which Google’s ads platform is optimized for particular strategies, and that’s true not just of different recruitment goals, but also different types of talent pipelines. Because Google’s algorithm determines the placement of your ad not just based on its contents, but on the contents of the links contained within the ad, Google AdWords tends to work better for people who link to individual job landing pages (for active job seekers) or landing pages for other means of staying in touch and entering your funnel (for passive job seekers). If you don’t have this sort of infrastructure in place, Google will penalize you and your recruitment efforts will be slower and more expensive. We’ve made the case on this blog in the past for implementing clean, relevant, and easy-to-navigate landing pages for each job post, but every company is different, and your pipeline no doubt reflects your recruitment needs—but those needs may not align with the factors that determine success on Google. The question, however, isn’t just “how do you want users to enter your application funnel?” It’s, “how do you want users to find you?” Are there relevant search terms that, when paired with ad targeting options, will actually draw users with the relevant experience and desire to learn to your website? For many of you, the answer will be yes. A company that’s looking to hire Python developers could easily attract them by providing relevant content that answers the questions about Python or related topics that your ideal candidate persona is likely to seek out via Google search. If this is your approach, then Google gives you the ability to highlight different elements of your EVP for different audiences, ultimately helping to turn relevant content into high quality applications. How Strong is Your Follow Through? Because Google is constantly juggling multiple bids from multiple companies for each search, it’s really not the kind of platform where you can “set and forget.” AdWords campaigns need to be actively managed as you go, or else they run a fairly high risk of sucking up your ad budget without providing much value in return. Most ad campaigns will involve a lot of trial and error at the outset, with advertisers making necessary tweaks to keywords and bids periodically as they refine their approach, and even as the campaign continues it will need to be monitored in terms of various KPIs and re-adjusted as needed. So, if you’re going to succeed on AdWords, you have to be ready, willing, and able to dedicate time and energy to keeping your campaigns on track. This might sound like a lot, but managing a Google AdWords campaign doesn’t really have to be that daunting. There are automation tools that can make the entire experience more user friendly, and most of the time your efforts will be more tweaking than in-depth strategic reimaginings. Really, you should read the paragraph above as an enjoinder to consider your EVP not as a static asset but as a dynamic element that shifts and evolves as potential job candidates (hopefully) see it and engage with it. This means integrating your EVP into a larger employer branding strategy that acts as an ongoing conversation with relevant talent. If you’re committed to doing so, Google AdWords can be a big help.